Note, The Kick Inside has now closed and has been replaced by Fleetwood Macchiato. 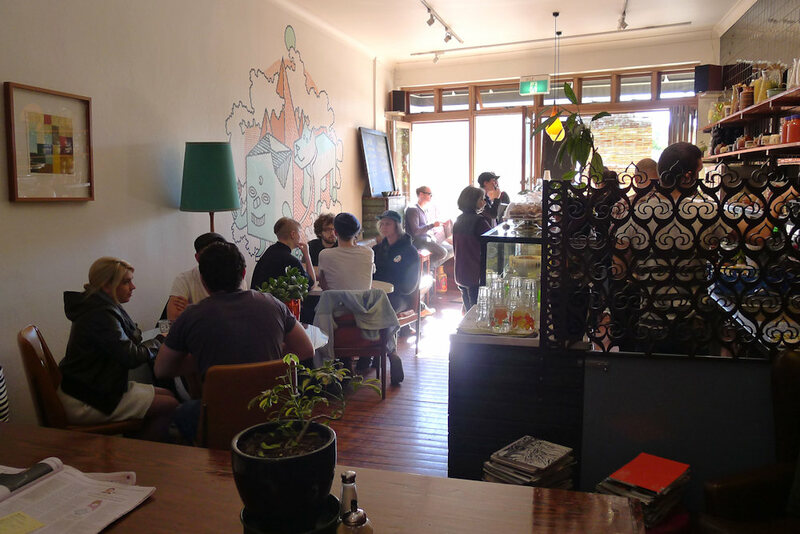 The Kick Inside feels more like a home than a café. Walking into the bustling establishment, we were greeted warmly and offered a seat on the couch and coffee while we waited. The kitchen is lined with 70s kitchen accessories and the entire theme is very retro and casual. This is a place that has flourished based solely on reputation. 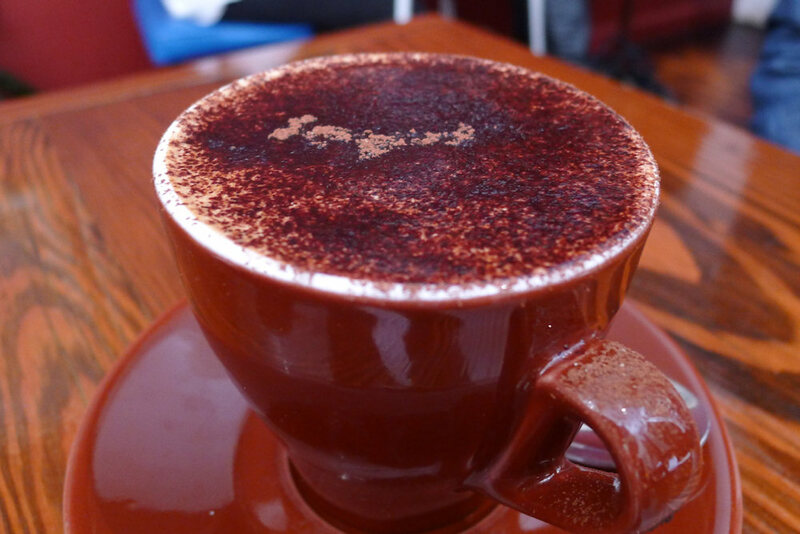 The menu is finite yet well executed and the coffee is simply outstanding. Golden Cobra is the blend of choice here. It’s an Australian based fair trade company that supplied beans to a limited number of cafés but hopefully this is something that will change soon as word spreads. 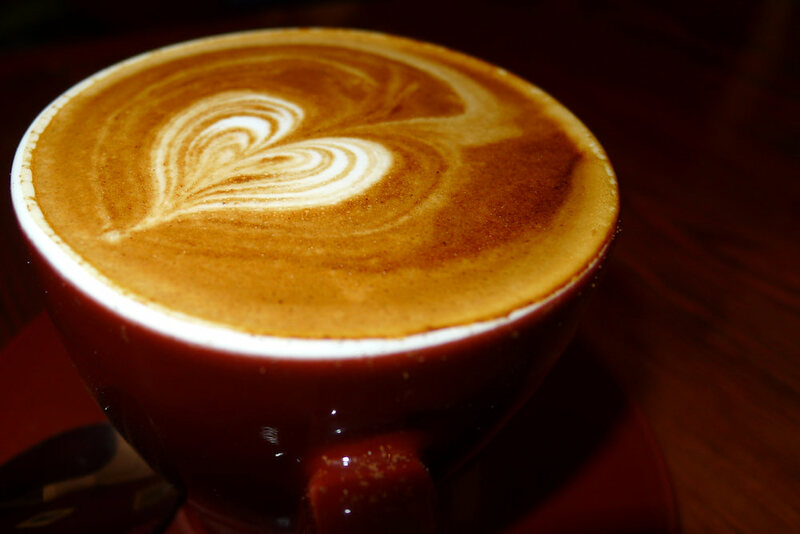 The coffee we tried was some of the best in recent weeks. The barrista really has refined his craft down to an art form. The cappuccino ($3) was perfectly brewed and we soon found ourselves doubling our order! No surprises here. The outstanding coffees continued with the flat whites ($3) and it was hard not to notice the ever-increasing crowd of people outside who come solely to get their kick. They are a very ecco-centric bunch at Kick Inside. All takeaway containers are biodegradable and the bacon and eggs are free range. We have nothing but praise for establishments with green pratices like this. 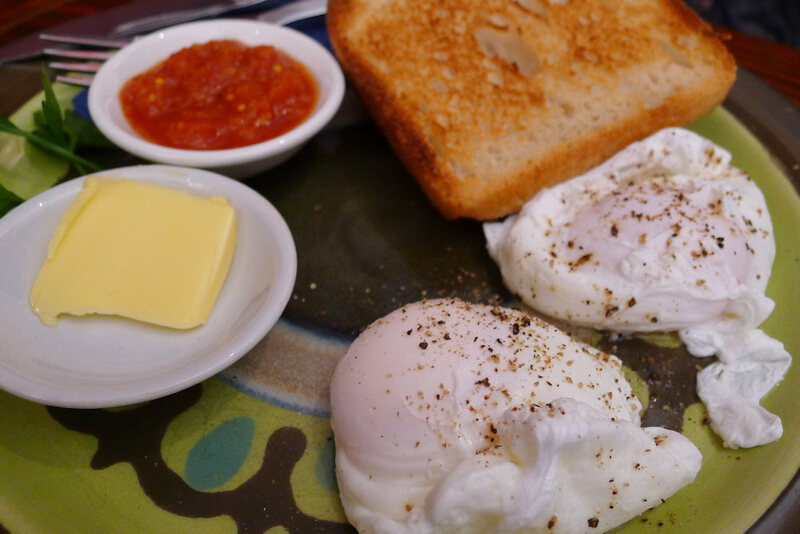 The poached free range eggs ($10) had been cooked just how we like them – with a gorgeous, runny bright yellow yolk. Most of the dishes here arrive with a tomato relish on the side. It’s quite sweet and has the power to turn eggs and toast into a fantastically flavoured dish. Somona is the bread of choice here and with good reason. Once we melted the butter over it, we were in flavour heaven. 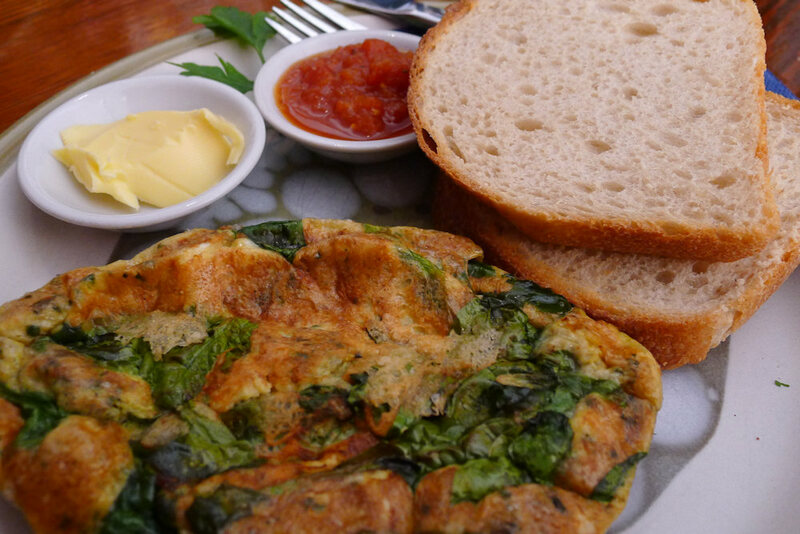 The spinach omelette ($14) looked more like a fritata than a traditional omelette. Loaded with three free range eggs & plenty of spinach and again with the tomato relish on the side, the omelette was a hit. Goats feta, pesto and parmesan are also throughout the omelette but the flavours were very hard to discern. This was interesting considering the strong flavours of some of these ingredients so we can only suggest reducing the number of ingredients but increasing their amount. Some other dishes that we’d like to return for on the relatively small menu include tarragon baked beans with grilled cheddar ($10.50 or $12.50 with ham off the bone), free range bacon and poached egg roll with tomato relish and spinach ($10.50), toasted sandwiches ($7.50-$8.50) and oven baked honey spiced muesli ($10). The final word however is that if you’re a coffee lover, The Kick Inside is one café you can’t miss. The helpful staff and friendly fellow patrons turned our morning dining in a great experience with a homely feel. This entry was posted in Sydney - Inner West and tagged Dog friendly, Eco friendly, Free range eggs, Fresh fruit and vegetable stores close by, Outdoor seating, Reasonable prices. Bookmark the permalink.